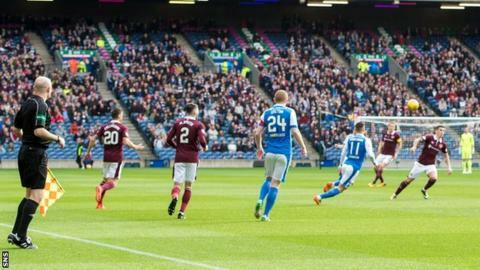 Hearts chair Ann Budge has confirmed the club's 5 November fixture against Kilmarnock will be played at Murrayfield. Budge says Hearts will "take further advantage of our contingency arrangements with the SRU," having played recent games at the ground. Murrayfield usually hosts Scotland and Edinburgh rugby matches. The main stand at Hearts' Tynecastle Stadium is being renovated to increase its capacity. Hearts arranged to play many of their opening Premiership fixtures as away games and have played 'home' games against Aberdeen and St Johnstone at Murrayfield, which will also host Saturday's league meeting with Rangers. Budge said of the Kilmarnock match: "These arrangements have been confirmed with all parties involved and I would like to record my appreciation for their co-operation in agreeing to the change in venue. "I will issue a further detailed progress update to our supporters later in the week. I would, however, take this opportunity to stress that the building programme will see the handover of Phase 1 requirements to the club within the next 10 days. "However, the time then remaining to enable 'acceptance testing' of all the various new facilities and processes would be very limited, were we to aim to play our opening game on 5th November, 2017. "One of our key objectives is to ensure that our first game back at Tynecastle runs smoothly, and provides supporters with the best possible match-day experience. We have therefore decided to take advantage of the opportunity open to us to call on our contingency arrangements for this fixture, thereby giving us more time to robustly test out all of our new facilities." Hearts' next scheduled home fixture after the game against Kilmarnock is against Partick Thistle on 19 November.